Lee Sharkey. Walking Backwards. Tupelo Press, 2016. 89 pgs. $16.95. The most striking characteristic of Lee Sharkey’s most recent collection, Walking Backwards, is its voice. Although many of the lines in many of the poems are grammatically straightforward, their meaning is often elusive. The speaker frequently sounds detached from her material, her tone nearly neutral, which ironically amplifies much of the content’s chilling horror. These poems examine anti-Semitic actions of governments and individuals, often during (or, more accurately, throughout) the twentieth century, though also contextualizing these comparatively recent attempts at Jewish annihilation within their endless history. Yet the collection also offers glimpses of beauty and is itself a sign of that most human need—to create beauty. Even as the poems narrate some of history’s most vicious events, the collection is populated by poets, musicians, and painters. 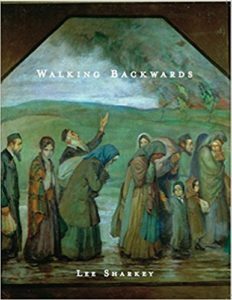 Ultimately, Walking Backwards also looks forward, confronting the future through the knowledge of evil, yes, but also with hope. Abraham and Sarah had waited decades, into their old age, for the fulfillment of God’s promise that they would be ancestors of a great nation. Meanwhile, Abraham had fathered another son, Ishmael, through Sarah’s maid Hagar. After Isaac was born, Sarah grew jealous and asked Abraham to send Hagar and her son away, which Abraham did, sending them out into the desert with only some bread and a skin of water, essentially to die. God saves them, but Abraham was clearly willing to sacrifice his first son as well as his second, Isaac, a fact that non-Muslim readers often forget (a version of this story is also narrated in the Koran). Without knowledge of this foundational story, “Betrayal” makes little sense, but the poem is much more than simply a retelling of the story. Sharkey relies on her skill with craft to create a poem that includes a theological interpretation but is so much more than that. Her use of alliteration and consonance, particularly as those elements influences rhythm, is particularly effective. The easeful repetition of “s” and “l” in the first line reinforces the meaning of “slides,” and the stress on “down” immediately following two iambic feet also sonically emphasizes its meaning. A similar effect occurs in the next line with “now the slow roll,” the long “o” sounds stretched out to slow down the pace. So far, the action relies entirely on imagination, as an egg’s journey those few inches from ovary to uterus is invisible. The poem opens musically, even a tad romantically, so readers are startled by the immediacy of the fourth line: “He wakes to the knife tip stroking his sternum.” This line, too, is musical, and the gentle word “stroking” belies its significance. The poem becomes more sinister as readers recall its appalling reference, but then the poem turns toward a more sympathetic and compassionate view of Abraham. Here, he is not a man driven by blind obedience, asserting his loyalty only to God. He longs to protect his son even as he sacrifices him, “smothering his dusky countenance” with his right hand, but “The left hand covering his face to save him from the fright.” Scholars—and believers generally—have argued for millenia about the meaning of this Biblical story, but one important element in the poem is the speaker’s empathy with the actors. Between these two final lines is another, the italicized “I have built seven altars and offered up seven sons,” a reference to Jewish midrash referencing Jewish martyrs, and particularly mothers’ experiences of loss, so in this particular poem, it serves to turn the conclusion back toward the beginning, the “seed pearl” becoming human life. In the context of the entire collection, however, this line links the poem to many others, to all those who have to some degree suffered a martyr’s death, killed for their identity. Stylistically, “Betrayal” resembles many of the poems in the collection. Its allusions are more ancient, as most of the poems address modern evils, those at least as difficult to fathom as the idea that God would command a man to sacrifice his son. Nothing about contemporary culture suggests that human beings will soon emerge from their determination to annihilate each other, a fact that makes Walking Backward all the more crucial. If anything will save us, it is our capacity for thoughtfulness, and it is thoughtfulness that most accurately characterizes this book. This entry was posted in A Review A Week on May 31, 2018 by Lynn Domina.